Piedras Negras, now located in Guatemala’s Sierra del Lacandón National Park, is the modern name of the Classic Maya polity of Yo’k’ib’ or ‘Great Gateway’. It was an independent city-state for most of the Classic Period and was allied with the polity of Yaxchilán (now in Mexico). It was excavated by a University of Pennsylvania team from 1931 until 1939 and then by Stephen Houston of Brigham Young University and Hector Escobedo from the Universidad de Valle de Guatemala from 1997 until 2002. Various scholars visited the site to record monuments and inscriptions throughout the years, laying the foundation for the decipherment of Maya hieroglyphs. For example, while working with monuments from Piedras Negras, Tatiana Proskouriakoff made the first decipherment of the names and dates of a Maya dynasty, a groundbreaking step which proved that history was recorded in Maya text (Proskouriakoff 1960). Between 1895 and 1899, explorer and early archaeologist Teobert Maler visited Piedras Negras to photograph several of the visible monuments (Maler 1901). He removed Piedras Negras Panels 1 and 2 at this time, taking them to Harvard University where they remain (O’Neil 2012: 189). During the 1931 to 1939 excavations, J. Alden Mason, then curator of the American section of the University of Pennsylvania Museum, obtained a permit that allowed for half of the monuments excavated at Piedras Negras to be brought to the United States on loan. 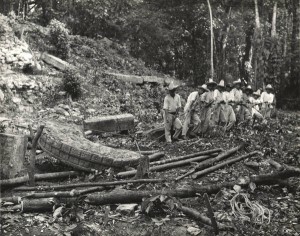 The remaining monuments were sent to Guatemala City. 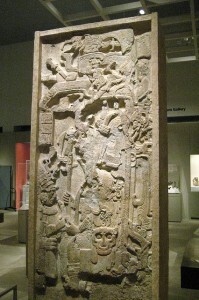 The University of Pennsylvania returned most of the Piedras Negras monuments to Guatemala in January 1947, retaining Piedras Negras Stela 14 (object number L-16-382) and a portion of Altar 4 on permanent loan with the permission of the Guatemalan government (Callahan 2009). In the early 1960s looters, reportedly from the town of Tenosique de Pino Suárez across the Mexican border, descended upon Piedras Negras (Stuart and Graham 2003). Stelae and architectural elements were sawn into pieces, carried across the border to Tenosique, and then sold into private collections in Mexico, the United States, and Europe (Stuart and Graham 2003). Stela stubs and other ‘scarred remains’ from this looting period are visible at the site and the current location of many of the monuments documented by Maler are unknown (Stuart and Graham 2003). The Mexico/Guatemala border in the Usumacinta region is both historically and currently volatile: it is an ‘area at the limits of state authority, where local and national governments struggle to maintain order and law’ (Golden & Scherer, 2006: ⁠2). Armed drug traffickers use the national park as a midway point: a base to receive cocaine and other drugs from Colombia that will eventually end up in the United States (Golden and Scherer 2006). These traffickers are supported by illegal settlers, often referred to as squatters, who maintain remote airstrips and protect shipments. In 2005 archaeologist Stephen Houston reported that drug traffickers had ‘basically encamped at Piedras Negras itself’ (quoted in Daniel 2005). Sources within Guatemala stated that the traffickers were heavily armed and linked to Mexico’s Sinaloa cartel (Daniel 2005). Guillermo González, then head of Guatemala’s drug police, stated that the site is essentially only accessible by the river, making it difficult for police to approach, and that whenever authorities did near the site, the drug traffickers would flee across the border into Mexico (Daniel 2005). In a post to the Mesoamerican archaeology email list Aztlan, archaeologist Charles Golden emphasised that the situation at Piedras Negras was dire: ‘This could be the moment in which Piedras Negras is lost to the looters for good…the Usumacinta is now a free trade zone for looters, loggers, and narcos’ (Golden 2006). 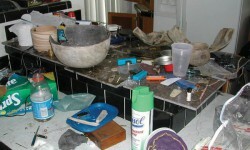 In 2008, reports continued to emerge of at least six groups of squatters occupying Piedras Negras (Ramírez Espada 2008). Piedras Negras Stela 1, located near the line of Stelae 2 through 7 but set below it, was recorded by Maler as broken into two large fragments. The stela depicts Lady K’atun, the wife of Piedras Negras Ruler 3 (Pitts 2003), and the back was better preserved than the front. In the 1960s, looters attempted to remove glyphs from the back of the stela and saw marks can be seen where columns J and K of the inscription once were (Stuart and Graham 2003). Piedras Negras Stela 2 was discovered by Maler in a row of stelae on a terrace in front of structure J-4. Maler described it as existing in three large fragments and the front of the sculpture, which depicts a standing ruler, was in otherwise good condition. In the 1960s the front face of Stela 2 was sawn away by looters (Stuart and Graham 2003). This face is now in 15 pieces. It is housed the Minneapolis Institute of Arts which acquired the stela around 1966 (acquisition number 66.10″ as a “Gift of the Guilford Morse Foundation”) from the Stendahl Galleries (Minneapolis Institute of Art 2012; O’Neil 2012: 193; Sachs 1966). Alan Shestack, a former director of the Institute, has admitted to being embarrassed by the presence of the stela fragment within the museum (Shestack 1999), particularly after it was listed in Coggins (1969) as being stolen. He states that it was ‘mutilated’ by looters and that it is ‘in wretched condition now, hardly enjoyable to look at’ (Shestack 1999). Piedras Negras Stela 3 was found by Maler broken into three fragments next to Stela 2. Although the front was in poor condition, the back retained an inscription which focused on Lady K’atun, Ruler 3, and their daughter ‘Precious Turtle’ who was depicted as seated on a throne (Pitts 2003). In the 1960s looters sawed the stela into smaller pieces, badly damaging the inscription. The looters attempted to extract the central figure but later abandoned it at the site, however they did cut the text away for later sale (O’Neil 2012: 200). Some fragments from this stela were purchased by the Brooklyn Museum and were mentioned in Coggins (1969). These were bought from Robert Huber, a Milwaukee-based dealer, for $3000 (O’Neil 2012: 200). Due to the mounting legal issues involved in owning Mesoamerican monuments at the time, the museum voluntarily offered the fragments to Guatemala in 1970 (Current Anthropology 1973). The fragments were formally handed over to the Guatemalan ambassador on 6 June 1972. Most of the fragments of Stela 3 are now stored in the Museo Nacional de Arqueología y Etnología in Guatemala City, however a very small portion of the back of the stela depicting a lidded vessel is said to be in a private collection in Mérida, Mexico (Stuart and Graham 2003). Piedras Negras Stela 4, discovered by Maler in the same stela line as Stelae 2 through 7, was initially found in three fragments. The front, which depicted a ruler holding two captives, was recorded as being well preserved. In the 1960s looters ‘trimmed’ the stela for easy transport and some of the sawn remains of the sculpture are now found in the plaza below the terrace that it once rested upon. A portion of the stela bearing the image of a captive is reportedly in an unnamed private collection (Stuart and Graham 2003). O’Neil (2012: 194), citing personal communication with Donald Hales, places the fragment in the collection of the Galerie Jeanne Bucher, Paris, at least at some point. A small fragment, a head from the figure’s belt, is in the Rufino Tamayo Museum in Oaxaca, Mexico (O’Neil 2012: 197). Piedras Negras Stela 5, discovered by Maler in the same stela line as Stelae 2 through 7, was intact when found. The front of the sculpture was described as being in pristine condition with the main portion of the work (about three fourths of the stela) depicting two individuals. This main portion was ‘thinned’ in the 1960s by looters to allow for easier transport, a process that destroyed the glyphs on the side of the stela. The bottom portion of the stela is still at Piedras Negras (Stuart and Graham 2003). The upper fragment was mentioned in (Coggins 1969) as being in an American museum, and Bator (1982) places it as being in the collection of the Museum of Primitive Art, New York. When the Museum of Primitive Art collection was moved to the Metropolitan Museum of Art, the MET arranged to keep the piece on long-term loan from the government of Guatemala as loan number L.1970.78 (Bator 1982). Piedras Negras Stela 7, discovered by Maler in the same stela line as Stelae 2 through 6, was found broken into two pieces. The front, which depicted an ornately dressed standing lord, was described as being in pristine condition with the remains of paint found on the figure’s costume. 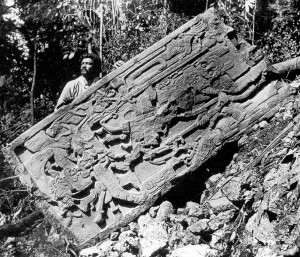 In the 1960s the stela was sawn into pieces by looters. The top fragment, which was ‘trimmed’ off the stela so that the ruler’s headdress and face could be removed for sale, is now housed in the Museo Nacional de Arqueología y Etnología in Guatemala City (Stuart and Graham 2003). This piece had been displayed in Mexico’s national museum in 1969 as the ‘piece of the month’. When it was identified as having come from Piedra Negras, Mexico returned it (O’Neil 2012: 204). Piedras Negras Stela 8 was found by Maler near the line of Stelae 2 through 7. It was broken into 3 pieces and the front, which depicted a standing Ruler 3 (Pitts 2003) and two kneeling figures, was described as being in pristine condition. In the 1960s, looters removed most of the upper half of the stela and the whereabouts of those pieces are unknown (Stuart and Graham 2003). Photos from the 1970s show that looters attempted to removed the carved body of the figure on the stela, accidentally cutting through its leg in an attempt to separate it from a carved captive (O’Neil 2012: 194). One of the two carved captives from this stela was found abandoned at the site and buried by archaeologists for its protection (O’Neil 2012: 194 citing personal communication with Stephen Houston). Piedras Negras Stela 9 was found by Maler on a large terrace to the east of structure J-3. It depicted a standing lord and was found in three weathered fragments. During the 1960s, looters sawed off a captive figure that was located in the lower left of the front of the sculpture (Stuart and Graham 2003). Piedras Negras Stela 10. A head ornament from the central figure’s belt was removed by looters (O’Neil 2012: 197). Its whereabouts are unknown. Piedras Negras Stela 11, originally located on a terrace in front of Structure 3, was discovered by Maler face-down and broken into two pieces. The sculpture was otherwise in good condition and it depicted a seated ruler surrounded by other scenes. 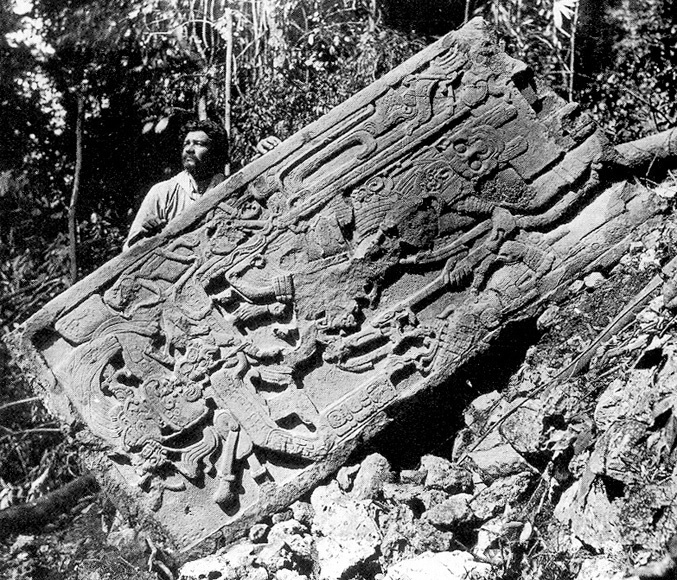 In the 1960s, looters sawed the stela into smaller pieces and transported it out of Guatemala. The piece depicting a seated ruler is now in the collection of the Museum of Fine Arts, Houston (accession number 68–51. Museum of Fine Arts Houston). According to Stuart and Graham (2003), the lower portion of the stela was reportedly in private hands in Switzerland as of 1995. Piedras Negras Stela 25, originally located in the South Group. This stela was ‘trimmed’ below the figure’s chin and near the top of the headdress so that the face could be removed for transport and sale (O’Neil 2012: 193). The worn face on this stela was re-carved after it was looted, making the head smaller and adding new eyes, a new nose, and a new mouth (O’Neil 2012: 199). A fragment of this stela is housed at Guatemala’s Museo Nacional de Arqueología y Etnología. The top of this stela, depicting the Principal Bird Deity, is in the Linden-Museum in Stuttgart (O’Neil 2012: 200). A fragment of this stela, it is unclear which, was in the Collection of Guy Loudmer and Hervé Poulin and was offered for sale at the Paris auction house Hôtel des Ventes in 1985 (O’Neil 2012: 206). Piedras Negras Stela 26, originally located in the South Group. A carved captive was sawn off of this stela by looters (O’Neil 2012: 194). O’Neil states that Ian Graham’s unpublished notes record that this fragment was once in Mexico City in the hands of a French collector. Piedras Negras Stela 29, originally located in the South Group. Two text fragments from this stela are said to be in Tokyo (O’Neil 2012: 200). Piedras Negras Stela 32, originally located in the South Group. Maler photographed this eroded stela during his work at the site (Mahler 1901: plate XXVI). In 1968, Parke-Bernet Galleries advertised a stela for sale which was found to be the significantly re-carved Stela 32 (O’Neil 2012: 199). O’Neil records that it had been cut into pieces, the text removed, and the entire front had been re-carved, seemingly using imagery from another looted and re-carved stela from a different site (ibid.). Piedras Negras Stela 34, originally located in the South Group. The front of this stela was cut in to pieces by looters and reassembled for sale (O’Neil 2012: 193). The Galerie Jeanne Bucher (Paris), purchased this piece sometime before 1966 (O’Neil 2012, citing Galerie Jeanne Bucher 1966, plate 17). Piedras Negras Stela 35, originally located in the South Group. A carved captive was sawn off this stela by looters based on a 2005 photograph (O’Neil 2012: 194). The top of this monument was also looted at some point and was in the Ludwig Collection then Rautenstrauch-Joest-Museum für Völkerkunde in Köln, Germany (O’Neil 2012: 195). Bator, Paul M. (1982), ‘An Essay on the International Trade in Art’, Stanford Law Review, 34, 275-384. Callahan, Maureen (2009), ‘Stela! Steeeeeeeela! (Can’t you hear me yella? )’, Penn Museum Blog. <http://pennmuseumarchives.wordpress.com/2009/09/04/stela-steeeeeeeela-cant-you-hear-me-yella>, accessed 2 August 2012. Coggins, Clemency Chase (1969), ‘Illicit Traffic of Pre-Columbian Antiquities’, Art Journal, 29(1): 94–98, 114. Current Anthropology (1973), ‘Brooklyn Museum Presents Stela Fragments to Guatemala’, Current Anthropology, 14, 579. Daniel, Frank Jack (2005), ‘Drug traffickers invade Mayan city in Guatemala’, Reuters, 23 February. Galerie Jeanne Bucher (1966), ‘Sculpture Maya’, (Paris: Editions Jeanne Bucher). Golden, Charles, (2006), ‘Letters Needed: Crisis on the Usumacinta’. Aztlan Listserve, <http://www.famsi.org/pipermail/aztlan/2006-August/000951.html>, acessed 7 April 2012. Golden, Charles and Scherer, Andrew (2006), ‘Border Problems: Recent Archaeological Research along the Usumacinta River’, The PARI Journal, 7(2), 1-16. Mahler, Teobert (1901), ‘Researches in the Central Portion of the Usumatcintla Valley’, (Cambridge: Peabody Museum of American Archaeology and Ethnoraphy, Harvard University). Minneapolis Institute of Art (n.d.), ‘Stela Fragment’, Website of the Minneapolis Institute of Art <http://www.artsmia.org/viewer/detail.php?v=12&id=8545>, accessed 11 April 2012. Museum of Fine Arts Houston (n.d.), ‘Seated Ruler from Stela 11’, Website of the Museum of Fine Arts, Houston <http://www.mfah.org/art/detail/seated-ruler-stela-11>, accessed 7 August 2012. O’Neil, Megan E. (2012) ‘Engaging Ancient Maya Sculpture at Piedras Negras, Guatemala’, (Norman: University of Oklahoma Press). Pitts, Mark (2003) A Brief History of Piedras Negras As Told by the Ancient Maya [online text], Pre-Columbian Society of the University of Pennsylvania Museum <http://www.famsi.org/research/pitts/pitts_piedras_negras_history.pdf>, accessed 7 August, 2012. Proskouriakoff, Tatiana (1960), ‘Historical Implications of a Pattern of Dates at Piedras Negras, Guatemala’, American Archaeology, 25, 454-75. Ramírez Espada, Alberto (2008), ‘Usurpaciones ponen en peligro reservas naturales’, Prensa Libre, 16 December. Sachs, Sam (1966), ‘A Mayan Stela’, The Minneapolis Institute of Arts Bulletin, 55, 44-45. Shestack, Alan (1999), ‘The Museum and Cultual Property: The Transformation of Institutional Ethics’, in Phyllis Mauch Messenger (ed. ), The Ethics of Collecting Cultural Property (Albuquerque: University of New Mexico Press), 3-102. Stuart, David and Graham, Ian (2003), ‘Piedras-Negras’, Corpus of Maya Hieroglyphic Inscriptions <http://peabody.harvard.edu/CMHI/site.php?site=Piedras-Negras>, accessed 12 April 2012. This list is far from exhaustive. More will be added as they are located. Sachs incorrectly lists the acquisition number as ‘66.11’.